related to USGS geological samples. cite as: U.S. Geological Survey (USGS) Coastal and Marine Geology Program (CMGP) St. Petersburg Coastal and Marine Science Center (SPCMSC): Archive of data and information related to the USGS SPCMSC Samples Repository geoscience collections. NOAA National Centers for Environmental Information. doi:10.7289/V5222RR4 [date of access]. 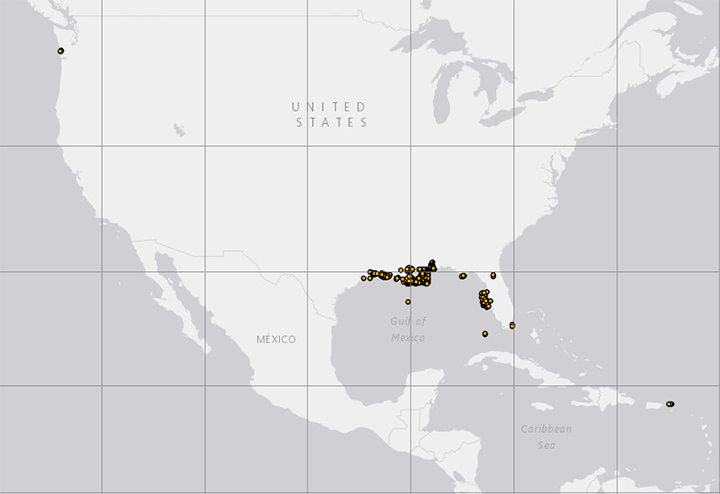 Open an ArcGIS interactive map interface with the USGS SPCMSC sample layer active, to search and download data from the IMLGS database and access related links. Offsite Linked Data interface (RDF graph) for Semantic Web access to USGS SPCMSC samples, offered cooperatively on the Rolling Deck to Repository (R2R) server. Text interface to search and download data for USGS SPCMSC samples from the IMLGS database and access related links. How to cite this data set (doi:10.7289/V5222RR4), all access options, and complete documentation. Documentation about the U.S. Geological Survey (USGS) Coastal and Marine Geology Program (CMGP) St. Petersburg Coastal and Marine Science Center (SPCMSC). U.S. Geological Survey (USGS) Coastal and Marine Geology Program (CMGP) website. Additonal related data and information are available directly from the contributing institution, which is the authoritative and most current source of data and information related to their sample collection. The IMLGS contains a subset of summary metadata from the institutional database. Purpose Information about USGS marine geosample collections is archived at NCEI to promote public access to research results and to increase their discoverability via the IMLGS. The Curator of the USGS CMGP SPCMSC Samples Repository prepares data and information contributed to the IMLGS and the NCEI data archive. Other Constraints cite as: U.S. Geological Survey (USGS) Coastal and Marine Geology Program (CMGP) St. Petersburg Coastal and Marine Science Center (SPCMSC): Archive of data and information related to the USGS SPCMSC Samples Repository geoscience collections. NOAA National Centers for Environmental Information. doi:10.7289/V5222RR4 [date of access]. Description of Source: Metadata describing USGS sample holdings contributed to the IMLGS are a subset of more extensive data maintained in the USGS Coastal and Marine Geology Program databases, reports, and publications. Additonal related data and information are available directly from the contributing institution, which is the authoritative and most current source of data and information related to their sample collection.